Readers who have been following my tweets might have seen that I was planning on dining at Stonehill Tavern down in Dana Point this evening. Those plans, however, were subsequently foiled. With Stonehill out of the picture, my dining companion and I decided on Indian, something that we hadn't done in a while. Ashoka was opened by a Punjabi immigrant, Darshan Singh. Singh arrived in the US in 1985, and worked in the Indian restaurant biz for two years prior to opening his own restaurant, named after Ashoka the Great. Ashoka (born Ashok Bindusara Maurya) was an Indian emperor of the Maurya Dynasty who ruled over the bulk of the Indian subcontinent in the second and third century BC. Somewhat ironically, the restaurant serves meat, despite the fact that Ashoka the Great was a noted proponent of vegetarianism. 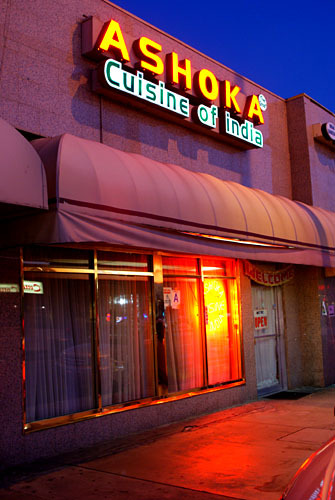 Ashoka is located on the stretch of Pioneer Blvd in Artesia known as Little India (a.k.a. the "International and Cultural Shopping District"). Note the "A" from the Department of Public Health, which also appears prominently on the restaurant's web site (in <marquee> text no less--at least it's not <blink>). The reason why this is important is that, at one point, Ashoka was "C"-rated, much to the chagrin of the owner. The decor is typical Indian restaurant chic, with booths lining the walls, tables in the middle, and the buffet station to one side. An interesting artifact, near the entrance, is a large board covered with photos of various Bollywood celebrities who have eaten at Ashoka. 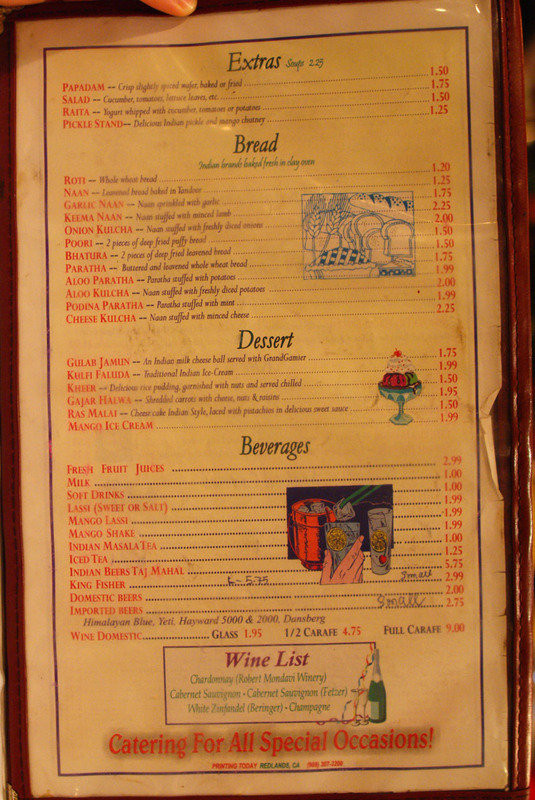 Here we see Ashoka's menu, fairly prototypical for a Northern Indian restaurant; click for larger versions. 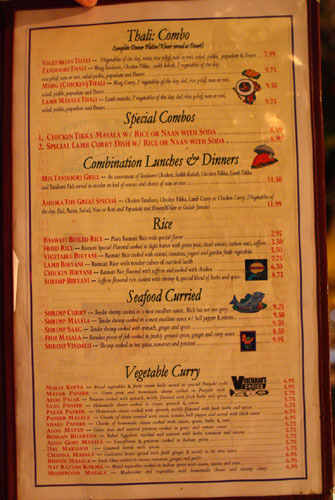 In addition, Ashoka is well known for its $7.95 lunch buffet. 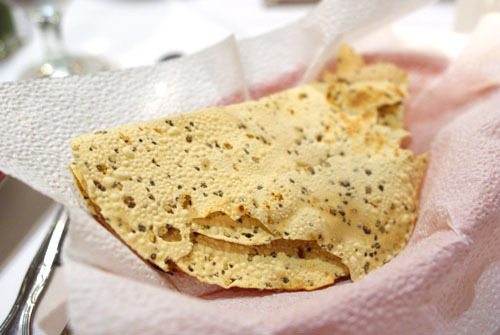 Upon being seated, we were quickly brought papadum, basically thin crispy wafers typically made from lentils. Ashoka's was actually one of the better versions I've had, with a nice bit of peppery spice and a lingering heat. 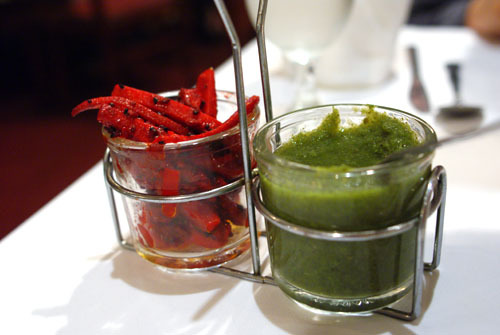 Following the papadum came two jars: one with mint chutney, the other with pickles. 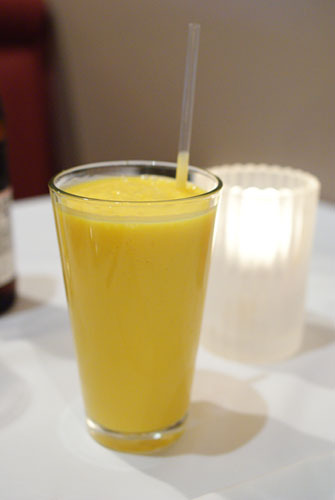 I started with my usual Mango Lassi [$1.99], a sweet mango- and yogurt-based drink. 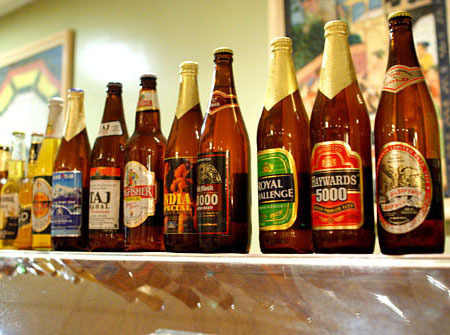 Beer in India began with the British importing it to the country during the early 1700's. The English even created the famous Indian Pale Ale (IPA) style, a highly-hopped brew designed to withstand the long voyage to India. The Brits eventually set up breweries in the country to brew their IPAs, but ironically, most breweries in India ditched the style in favor of lagers during the 20th century, and to this very day, no major brewer in the country produces an IPA. Getting back to the beer at hand, we first ordered up a Taj Mahal Premium Lager [$5.75], from giant United Breweries Group out of Banglore. UB has a roughly 50% market share, and also produces India's best-selling beer, Kingfisher. 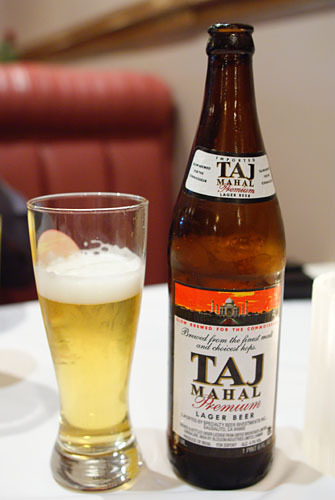 The Taj Mahal was fairly nondescript by itself, with light carbonation and not much in terms of flavor, but went decently with the food. 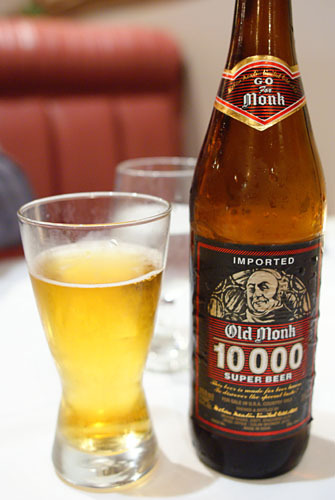 The next beer was much more interesting: the Old Monk 10000 [$5.75] from Chennai's Mohan Breweries & Distilleries Ltd. It was easily the most interesting Indian beer I've had, with a flavor that reminded me of watered-down whiskey! The brewery also makes Golden Eagle, a more mainstream lager. Ashoka actually had the most interesting selection of Indian beers I've encountered, and had we not been so full from the food, we would've certainly ordered up more bottles. Perhaps the Haywards 5000 and Royal Challenge from Mumbai's Shaw Wallace & Company Ltd (now part of SABMiller)? Or maybe India Special from Yuksom Breweries out of Sikkim (they also make Himalayan Blue, Yeti, and Dansberg)? Definitely Manav Breweries' Karma from Ghaziabad. Next time. 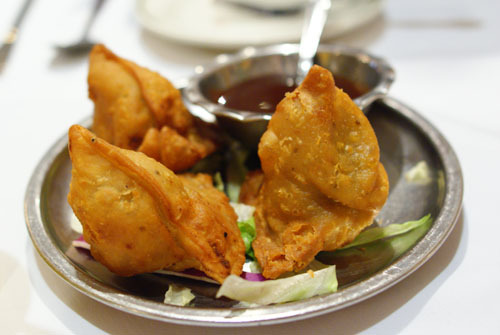 I usually like to start my meals with some samosas, basically fried pastry tetrahedra stuffed with potatoes and peas. The examples here were some of the better ones I've had, with particularly crisp shells, lovely spice on the potatoes, and great use of peas. Though they could've easily stood on their own, the samosas came with a tamarind chutney, which provided a sweet counterpoint to the savory turnovers. 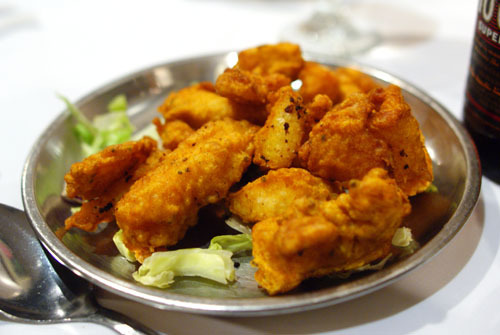 A popular snack food, pakoras consist of a main ingredient, in this case chicken, battered in chickpea/gram flour and deep fried. Though the chicken was a bit dry, I did appreciate its delicately spiced flavor, heightened by the application of mint chutney. 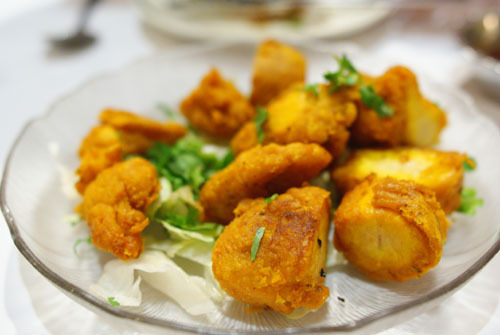 For pakoras, fish is a less common filling. The examples here were good enough, but the essence of the fish was overpowered somewhat by the batter, resulting in a rather monolithic eating experience. I much preferred the chicken version, though once again, the mint chutney did help things. 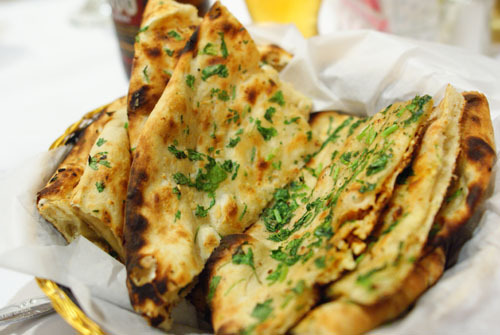 To go with our mains, we requested the typical accoutrements of basmati rice and garlic naan. 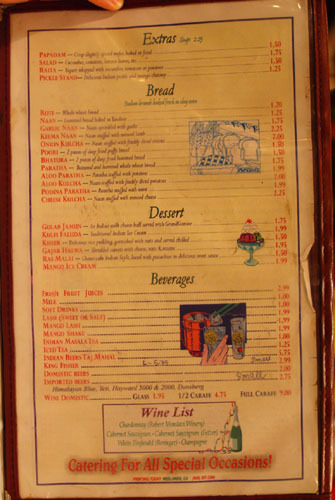 Disappointingly, the Cheese Kulcha [$2.25] we ordered failed to make an appearance. When trying out an Indian restaurant for the first time, I invariably get the chicken tikka masala, which I use as a sort of gauge. The irony is that it isn't even a "true" Indian dish; rather, it was created in Great Britain by a purportedly Pakistani chef. 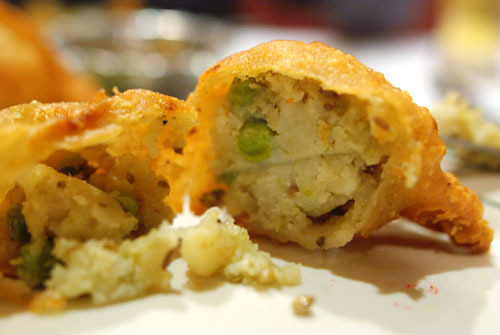 Nevertheless, the dish is immensely popular, and I've seen variations of it at every Indian restaurant I've been to. 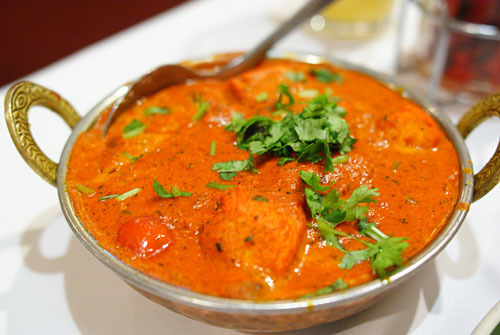 Chicken tikka masala is made from chicken tikka (spice- and yogurt-marinated chicken chunks baked in a tandoor), served in a creamy tomato-based masala, or mixed spice, sauce. 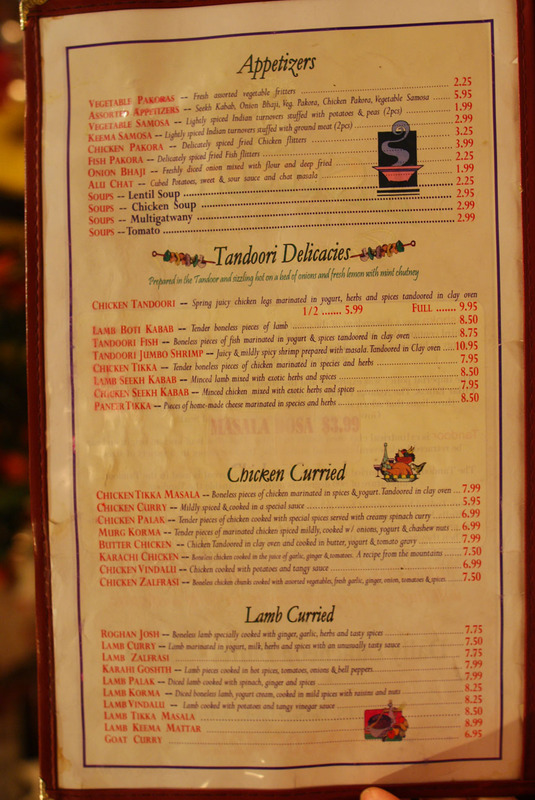 The example at Ashoka was certainly a tasty preparation, though the chicken could've been more tender. I enjoyed the sauce, which was somewhat lighter and less tart than usual, allowing the chicken to take center stage. 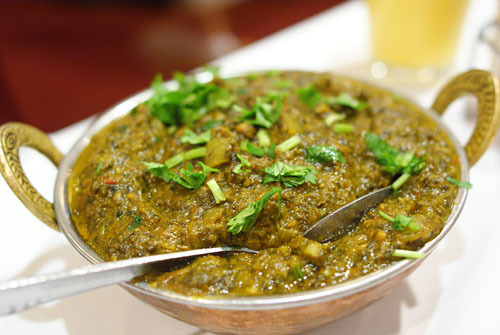 Palak refers to a style of curry dish made with spinach and an assortment of spices (the distinction between "saag," I believe, is that saag curries have mustard leaves in addition to spinach). The most popular variant is palak paneer, a cheese and spinach curry. 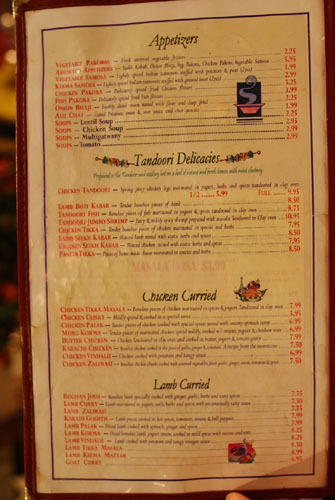 Meat can also be used, with chicken and lamb being the animals of choice. We chose lamb this time, and noted that the meat was robust in flavor, a bit gamy in fact--very distinctly lamb. This wasn't a problem though, as the spinach effectively tempered the power of the meat, leaving a long, vegetal finish on the palate. 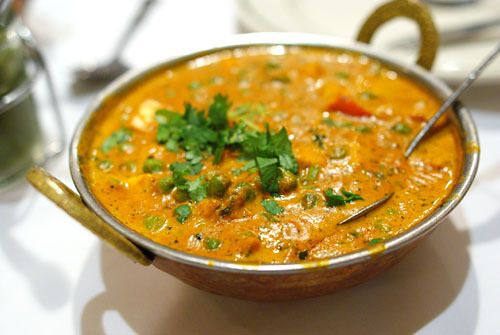 Finally, we have a dish of mattar (peas) and paneer (cheese) in a tangy, spicy, savory sauce. This was actually my favorite dish of the night, with the firm yet yielding consistency of the paneer, as well as its mildly tangy flavor, being especially notable. The peas were just as important, with their vegetal smack providing a key counterweight to the gravity of the dish. Despite being ridiculously full at this point, I saved room for dessert (which seems to occupy its own separate compartment in my stomach). 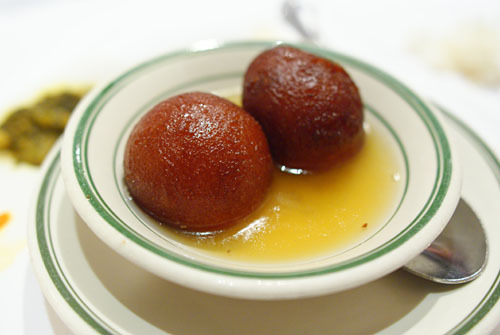 We went with the gulab juman, spheroids of khoya (a cheese product) garnished in a sugary rosewater syrup. It was one of the best I've had: hot, buttery, sweet, rich, delicious. In the end, though Ashoka doesn't really bring anything new to the table, it's still a nice place to get tasty, dependable preparations of classic North Indian fare; I would have no qualms about coming back. Look at it this way: if Ashoka's good enough for the likes of Sanjay Dutt and Satish Shah, it's good enough for me. That said, I love the dosa spots in Artestia. Hi Kevin. I love Pioneer Blvd. I wish Anthony Bourdain would've done a "No Reservations; Pioneer Blvd" episode, and just gone down that street eating Chinese, Korean, and Indian cuisine. But his recent "New York Outer Boroughs" episode is close enough/better. My pick for Indian food on that street is actually The India Restaurant, which is more down the street and straight across from the 99 Ranch Market. I believe I already told you about Seoul Soondae on that street as well. Hope to run into you in one of these spots one of these days! Nice review and pics as always. The beer selection is impressive. My go-to spot in this area is Rajdhani with their all-you-can-eat vegetarian menu (not a buffet, they just keep serving you food). Very filling, but so good! Jai: So basically, keep it South Indian and you're down. ;) Which are the dosa spots that you like? 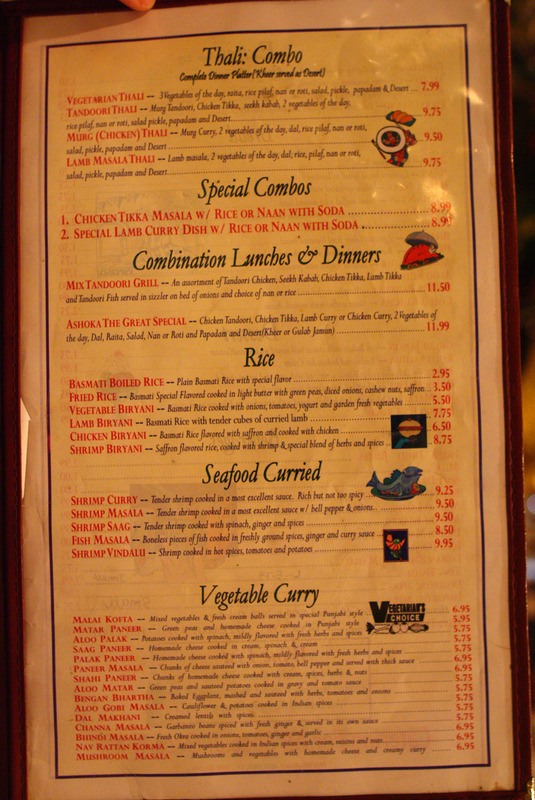 Yena: The India Restaurant was also one that I was considering--next time. Funny you mention Seoul Soondae though, as I had a dream last night involving soondae! 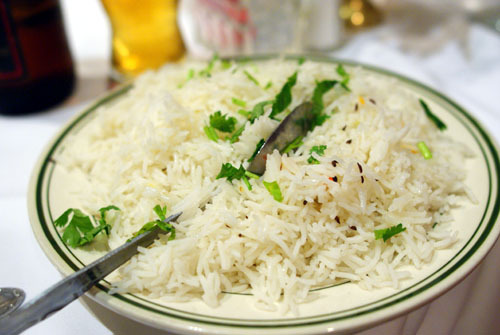 Daniel: Rajdhani was another one I wanted to try, but my dining companion had already been. They only do it thali-style right? Jane: I read your reviews on both places. Are you back in town now? hi kevin, yes - i'm back! i'll msg you soon to catch up. it looks like you and ryan have been keeping busy with your amazing food adventures!